Collecting movie props always seemed to me like a pretty fruitless endeavor. Sure, you could own Indiana Jones’ bullwhip, or Rocky Balboa’s gloves, but honestly, once you’ve got ’em…so what? You think that’s gonna make you happy? Bet you laid? Buddy, you’re dreaming. 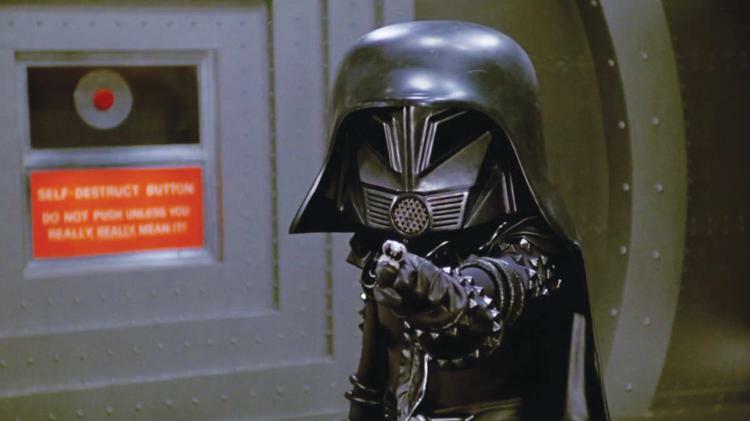 Rick Moranis hero “Dark Helmet” helmet from Spaceballs. (MGM, 1987) This articulating oversized signature helmet was worn by Moranis as Dark Helmet throughout the Mel Brooks classic Sci-Fi spoof. Consisting of 20 in. round by 14 in. tall cartoonish “Darth Vader”-stylized helmet constructed of heavy vacuum formed plastic component shell affixed to internal construction worker’s hard-hat liner to fit the actor. With screw-hinged movable faceplate section featuring vents, metalized shower drain mouth piece and triangular embedded tinted see-through lenses. Now, far be it for me to tell you how to spend your hard earned shekels, but considering that this is likely the coolest piece of cinematic memorabilia this side of Tatooine, it seems like the sort of thing you, dear Heeb reader, should probably jump on at ludicrous speed—especially given rumors of a Spaceballs sequel in the future. So use the force, use the Schwartz, use your parents credit card. I don’t care. Just buy this helmet! And promise to let me wear it once in a while, if you do.